Don’t avoid conflict__whenever you strongly disagree__for the sake of feigning courtesy or harmony. At the same time, never make the conflict personal. Focus on the issue. Never on the person. There are often times, when you will not want to accept what is being said or proposed or done. Yet you will not want to wave a red flag or raise an objection or even make a point because you fear that the “harmony” in the relationship or environment will be lost. And that you will be accused of disturbing it. So, you will choose to swallow your sentiments, submit to being popular than being authentic, and simply go on. Now, clearly, whenever you allow something to happen, with which you don’t agree principally, remember you are maintaining decorum externally but within you there is a violent churn. You are grieving, for, within you, there is chaos, turbulence, sorrow. And therefore your justification that you are choosing to ‘give in’ or remain ‘mum’ for the sake of ‘harmony’ falls flat on its face. This is not an intelligent way to live! But this is the way we ‘adjust’, ‘accommodate’ and claim we ‘adapt’ in Life – all the time. This is true in all our relationships: boss-subordinate, parent-child, husband-wife, between lovers, neighbors and siblings. Every time we choose not to disagree, in order to prevent a debate for whatever reason, we are allowing a part of us, in the context of that given relationship, at that point in time, to die. I am not saying that you take up cudgels on every issue, with everyone under the sun, and become combative. It is totally pointless to keep fighting people all the time. In fact, I am not even saying fight over an issue. All I am saying is please express yourself. Allow your sentiments to flow – in the context of the issue, irrespective of who you are dealing with. It is unlikely that the other person may agree with your sentiments. But at least the other person will know what__and how__you are thinking. When you express yourself, you are in harmony, you are free, you are traveling light! On the other hand, when you keep things bottled up, within you, you are simmering within, under the pretext of maintaining dignity and decorum outside. An intelligent conflict, an intellectual debate, is far more harmonious than a pretentious peace when your insides are boiling over. Now, there will be times when your effort to debate is received immaturely. And you are dealt with a personal, often below-the-belt, response. When that happens, your awareness should help you not to get provoked, not to retaliate, but to stay with the issue – without getting personal. If you find that any effort is not worth it in this context, simply move on. Just don’t grieve. And, at all times, please don’t try to be a martyr. Self-martyrdom is very bad for your self-esteem and inner peace. This is the way of the Tao that champions ‘effortless action’. The import here is that as long as you do what comes naturally to you, without having to make an effort, you will be at peace with yourself. So, if you must disagree while expressing yourself, please do so, even if it means being in an issue-based conflict. Except that such expression must be effortless. On the other hand, if refraining from expressing your sentiments requires a huge effort – which, in turn, affects your inner peace – drop that effort. 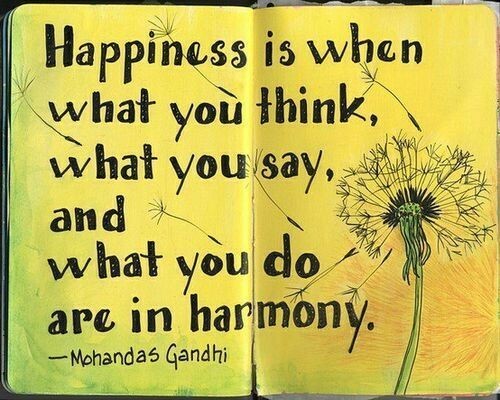 Harmony begins with you. Unless you are at peace with yourself, in any context, you cannot live fully. And if you are not living fully, you may well be alive, but you were dead long, long ago!